Alright, this has been bugging me for a while. When I first start up Code::Blocks, it's fine. But when I switch to a different window, say to look at a tutorial or to change my music, this'll happen. 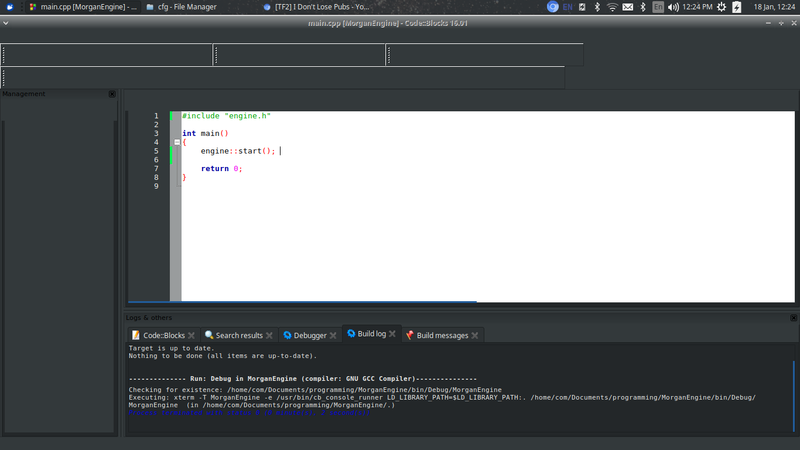 As you can see, the toolstrip at the top is invisible, as are the compile buttons, project management pane, and tabs. The toolstrip and compile buttons still work, but the management pages and tabs don't. The only way to fix this is to restart code:blocks. This is on a relatively fresh install of Ubuntu. Everything on the system is fully updated. I've googled this issue and I've turned off the symbol browser as suggested. Still happens. I've reinstalled code::blocks and updated it. Still happens. I've restarted my computer countless times. Still happens. This happens whether I minimize the code::blocks or just change focus to a different window. This doesn't happen with any other program. I'm at my wits end. I just want to work on my stinking programming. Any help is very appreciated! This seems to be a wx3.0 issue with old codeblocks versions. What version are you using? Have you tried the last release? Install 17.12 and you should be fine.